Imagine it. You&apos;re sitting at work in Middleburg and you&apos;re craving that delicious meal from Mokomandy in Sterling. While the trip to the restaurant is an easy one, you have a meeting after lunch and wouldn&apos;t have the time that this kind of mouth-watering dish deserves. Luckily for you, and for all, many Loudoun restaurants are taking their food on the road. And I&apos;m not just talking about a booth set up at a local festival. Mokomandy, Pittsburgh Rick&apos;s, King Street Oyster Bar and Parallel Wine Bistro all have food trucks that bring food to the masses. For the past seven years, and going strong, Mokomandy has been serving up Korean, American and Cajun fusion cuisine to restaurant guests. Head to Sterling to celebrate an uncommon and unique combination with dishes like Cajun Cassoulet, Korean Pot Roast Sliders, Bison Dumplings and more in small, medium or large portions that provide you and your family and friends a variety of options. If you can’t make it to the restaurant, then start following the Mokomandy Food Truck on social media to find out where you can get these delicious meals on the road. In 2014, Pittsburgh Rick’s opened their brick and mortar restaurant in Downtown Leesburg to offer a menu filled with authentic, Pittsburgh-style sandwiches topped with fresh cut fries, apple cider slaw, and tomatoes in addition to wings and other deliciousness. 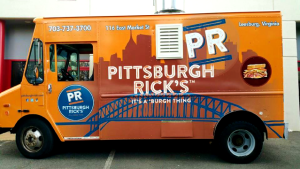 Two years later, after roaring success, Pittsburgh Rick’s decided to close their doors and focus on their food truck full-time. Their casual menu items are available all over Loudoun and beyond. Find them in Downtown Leesburg, Sterling, Ashburn and more. Make sure to check their social media for the most up-to-date locations. King Street Oyster Bar’s food truck is still a work in progress, but Loudoun-ites will soon be able to enjoy the delicious seafood offered at their Downtown Leesburg location on the road. This restaurant has only been open for a few years, but has quickly become a local favorite because of their great seafood dishes, fantastic happy hour menu, expansive view of King Street and beautiful outside back patio. 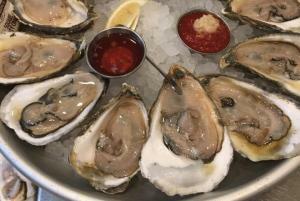 Try crowd-favorites like chipotle crusted oysters, blue crab and corn chowder and salmon blt. Make sure to also be on the lookout for details about their new location opening in Middleburg! 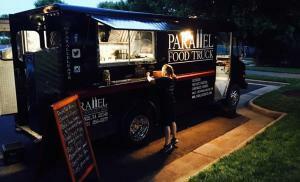 This summer not only brought the fun times and sunshine, but was also the debut season for Parallel Wine Bistro’s food truck. Parallel Wine Bistro’s success began years ago with the opening of their restaurant in Broadlands. Known for their brunch, crazy hour menu and great drink selection with 80+ bottles of wine, Parallel Wine Bistro has always been a favorite in Loudoun. 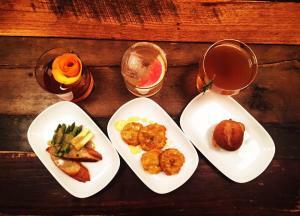 Now, fans can find their great menu items all over Loudoun. Follow their social media to find out where you can get duck fat fries, bacon lollipops (yes, you read that right. Bacon. Lollipops. ), chipotle pork tacos and more. The restaurant scene in the county has been growing with new restaurants opening and renowned chefs choosing Loudoun as their home. Whether you are heading to the restaurant or becoming the food trucks’ newest groupie, you will not be disappointed with the food options that Loudoun has to offer.